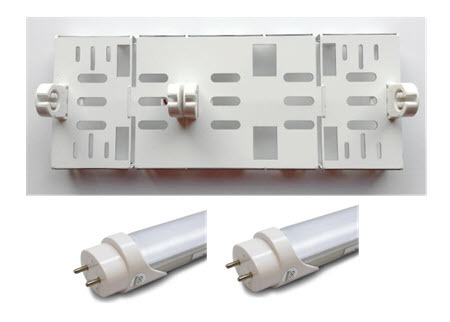 LED 8-foot lighting retrofit kit with two bulbs is a set of components that allow you to convert one lamp 8-foot fixtures to a two lamp LED in a fluorescent to LED configuration. It saves energy by directly converting 8 foot T12 slimline instant start lamps to LEDs. Here's what makes it so easy to use, it comes prewired, so there's no problematic rewiring to change to LED lamps. This retrofit kit requires that you use the existing ballast cover from the previous fixture, so you want to save those and reuse them. The LED tubes are included, and you can choose the color temperature that you would like that best fits your interior space. The color temperature choices are 3500K, 4000K and 5000K. The 3500K is a neutral slightly warm light, the 4000K is like office lighting white, and the 5000K is like noontime daylight. For most industrial or commercial applications people typically choose the 5000K for its whiteness and brightness. So now you can get rid of those eight-foot fluorescent lamps that most people would like to change to something more energy-efficient. These are easy to install, and each one will take just minutes to change once you get going. A fluorescent strip light fixture has been the mainstay of things like warehouse lighting, production facilities and anywhere you want to get a lot of light, but many people want something like LED now which can give them the same amount of light for fewer watts. To install, all you need to do is take off the existing ballast covers, take out the ballast and sockets, so you have the channel left. Then you can take the LED retrofit kit and attach the new ends in sockets wiring it directly to direct power. The LED lighting tubes themselves are LED T8 lamps, so they are the same physical size as the older fluorescent T8. This is a great way to change out your existing a fluorescent fixture to LED, and it’s done at a low cost as well. We mention T8 lamps here, but these can be used with either T8 or T12 existing lighting systems. Most people are changing the eight-foot lamps that have a single pin, but there are situations where people might be changing the high-output version, in either case, it all depends on your personal preference for you strip fixture. As far as energy savings go, you should see a substantial reduction in lighting costs and get great paybacks as a result. Most people when they do a retrofit will have a payback from one to two years without any utility rebate. If you do have utility rebates in your area, you may see that reduced even further making it something easy to implement for your situation. This product is made in the USA with high-quality standards making it something that’s going to last for a very long time. Some people are motivated by energy savings, but there are maintenance savings involved as well. The light bulbs have a very long life, much more than the old eight-foot lamps and they are easier to change. - 2 LED lamps included.